Welcome to 4919 Nolda St. in the heart of Rice Military! $60,000+ in recent upgrades! Kitchen includes a 2-Tap KEGERATOR, Oversized Island w/Petra White Quarzide slab, Bar/Buffet with built-ins. LOCATION!!! Walk outside your door to Starbucks, local eateries, breweries, wineries, bike & hike trails. Quick I-10 access to Downtown & Galleria. Fabulous Open Concept Layout. 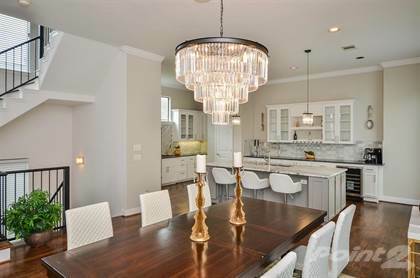 Entertain from this incredible Kitchen to the Dining Room to the Living Room! Bluetooth Ceiling Speakers & More!!! View of Spacious Dining Room! 108"x52" Island w/Petra White Quarzide Custom Slab, Bar/Buffet w/Kegerator, Wine Chiller & More!!! Carrera Marble backsplash, GE Profile appls, Vented Gas Cooktop w/Pot-filler. Chef's Kitchen with endless cabinet/counter space, w/double sink. Dry Bar with Wine Cooler, Kegerator, Carrera Marble Backsplash & Many Built-Ins! If you love to cook or just want to look like you do, this is the house for you!! Another unbelievable view of this Chef's Kitchen. Very detailed remodel. Great space to have a 70"+ Flat Screen! Another view of Living Room area. Balcony and half bath to the right. Stairs lead up to the 3rd Fl retreats! Bluetooth Ceiling Speakers on entire 2nd Floor. Beautiful stacked-stone gas fireplace with remote. Italian marble tile floor inlays. 2nd Floor Balcony off Living Room area. Half Bath on Main Living Area on 2nd Floor. Granite countertop with Stainless Steel Basin with wall valves. This is living! Great view of Master Retreat reflecting how spacious it is! Very private Master Retreat! Wonderful layout! Master Bedroom Retreat has double doors that lead into private ensuite and walk-in closet. Crystal chandelier ceiling fan. Spacious Master Retreat Sitting Room. Great Downtown Skyline Views! Spa-like retreat in your own home! Master ensuite. Lighted rainfall shower head with 6-waterjet massage system. Frameless glass shower & Italian marble throughout Master ensuite. Bubbles or Bubbly? Completely your choice! There's definitely room for two in this spacious 6-jetted tub! Ooooooh La La!!! Spacious double sink with vanity area. Custom Petra White Quartzide countertop slab. Lighted faucets. Laundry area located on 3rd floor between Master Retreat and Guest Bedroom. 3rd floor stairwell with clear view down to 1st floor. 3rd Floor Guest Bedroom with fabulous Downtown Skylines Views!!! Petra White Quarzide custom countertop slab. Lighted faucets in all bathroom ensuites. 1st floor entry leading to 2nd floor main living area. This is location! Starbucks across the street, restaurants and local venues all within walking distance! Street parking is also available!!! Ability to buzz your guests in while your on another level of the home or while your out. Remote access system. Wrought iron stairs with open view from 1st to 3rd floor. Foyer entry to 4919 Nolda St. To the left is the 1st Guest Bedroom. To the right is the attached 2-Car Garage Entry. 1st floor Guest Bedroom. Double glass privacy doors. Use as a bedroom or office. 1st Floor Guest Bedroom with private ensuite with walkin closet. 1st Floor private ensuite with Italian marble tile. Petra White Quarzide countertop slab. Fine finishings! Another view of 1st Floor Guest Bedroom. Currently used as an office. Double glass door entry with pendant chandelier & exterior lighting. Houston Skyline Views from Master Sitting Area & Guest Bedroom!!! Description for 4919 Nolda St.
Hi, I'd like to find out more information about 4919 Nolda St.. Thanks so much!